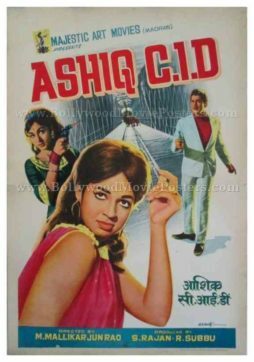 Vintage Bollywood poster of the Hindi film Ashiq CID (1973) for sale. Featured here for sale is a vintage Indian film poster of the 1973 Hindi film that starred Bharati Devi, Krishna Ghattamaneni and Jyothi Lakshmi in lead roles. Printed and circulated during the first release of the film (early 1970s), this vintage Hindi film poster was originally designed for publicity of the film but never ended up being used. This vintage Indian film poster features stunning hand painted artwork. Originally designed on canvas by Bollywood poster artist AS Murty, this vintage Hindi film poster features his printed signature on the bottom right hand corner. Vintage hand painted Bollywood movie poster of the Hindi film Ashiq CID (1973) for sale. Featured here for sale is an old hand painted Bollywood movie poster of the 1973 Hindi film that starred Bharati Devi, Krishna Ghattamaneni and Jyothi Lakshmi in lead roles. This old Bollywood poster features a stunning collage created by using both hand painted artwork and photography in an optimal mix. Originally designed on a canvas board by Bollywood poster artist AS Murty, this old Bollywood poster features his printed signature on the bottom right hand corner. Stunning still photographs of the two leading ladies from the film are seen on either side of the poster. The lead protagonist is seen holding a pistol in a smaller photographic still in the center. The background is hand painted and features a cobweb prominently in the center, suggesting the theme of the film.